Where does the time go? 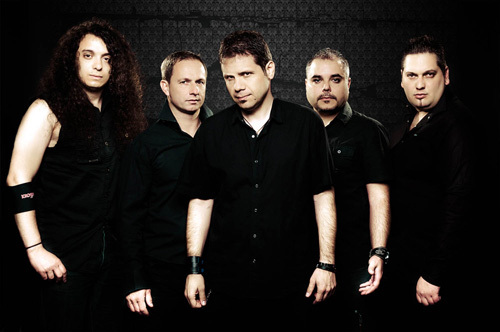 It's been five years since Bulgaria's Krossfire delivered a new studio album. They return with Shades Of Darkness, and the band remains in fine form, advancing in musical creativity and maturity. They should be. After all, the been at this game for 15 years. To remind you, Krossfire plays a hybrid of musical genres. Largely their sound is melodic heavy metal, yet drawing melodic hard rock, parts of power metal and with this album, some more stronger symphonic elements. Following this orchestral motif the band drops in choral vocals (featuring Vesela Sarvanska, Svetlana Vassileva, Krassimir Shopov, Georgi Sakadzhiyski) on three songs: The Last Ride, Anabelle, and Heaven Halls. In several songs, Destiny's Calling, One More Time, and Heaven Halls, the band has dropped in some female vocals from Violeta Kusheva. Dimo Petkov remains the principal and lead vocalist, with the female voice adding accent and color. Listening, some might suggest, from their arrangements, that Krossfire is nearing progressive metal. Others, including myself, might suggest something more akin to cinematic and symphonic melodic metal akin to Rhapsody Of Fire, among others, but not quite as bombastic. I hear this as the opening intro The Ninth flow into The Last Ride and King Will Come. Later in the softer Farewell, this classical music feeling rises even more with the prominent piano line and the deeply moving cello, perhaps my favorite string instrument in the violin family, from Daniela Djorova Waldhans. Heaven Halls is another that suggests more symphonic metal with notable operatic female vocals. Alternatively, Krossfire can still deliver some rather direct heavy power metal. Fall From Grace, Rule The Dark, King Will Come and the longer Annabelle have both the intensity of strong riffs and brisk pacing. In midst of all these songs you'll find an increase in keyboard solos and abundance of fiery guitar solos. As a whole, Krossfire's Shades Of Darkness is definitely a strong album: musically forward and mature, exceptionally creative, and a very enjoyable listening experience. Recommended. 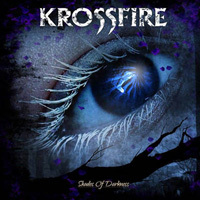 Krossfire's Shades Of Darkness is definitely a strong album: musically forward and mature, exceptionally creative, and a very enjoyable listening experience. Recommended.